You are here: Home / Free Printables / FREE Story Map Brochure Printable + more! FREE Story Map Brochure Printable + more! If you’re homeschooling middle school age children, then this is the resource for you! 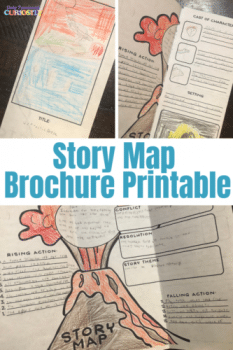 Check out this Story Map Brochure Printable + more! Only Passionate Curiosity has created a great go-to resource for homeschooling parents for their English lessons. Teaching story structure can be incredibly difficult. But, with this Story Map Brochure Printable, you can give your child a template to work with. It will help them break down the story into its many elements, and it gives them a deeper understanding of story. You can use this for whatever story you may be working on at the time. And, if you need a little extra guidance or encouragement in the process, this post also has tips and other ideas for you! For another story map resource, check out Lesson Download: Learn About Story Structure! Get this Story Map Brochure Printable today!